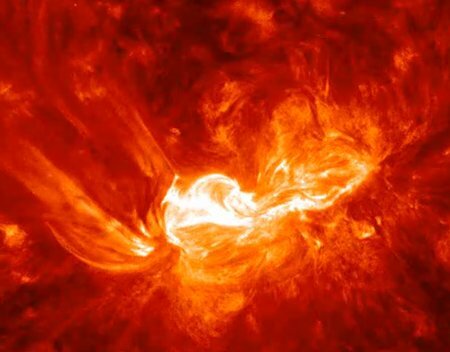 Check out these amazing videos of the powerful Valentine’s Day solar flare, captured by NASA/SDO (Solar Dynamics Observatory). NASA comments that it “looks like the new solar cycle is beginning to ramp up”. It will be interesting to see how that will impact life here on Earth, as we’ve been around solar minimum for years but still we’ve been experiencing record high global temperatures and record low Arctic sea ice. This Valentine’s Day flare released a blast of charged particles that was due to hit Earth’s atmosphere on the night of February 16. Apparently, this could cause auroras farther south than is usually the case. No doubt that would be spectacular to see from the ground. National Geographic points out that this flare measured roughly 35 million degrees Fahrenheit, or 19 million degrees Celsius (hot! ); that’s according to Dean Pesnell, project scientist for NASA/SDO. Here’s an animated image of the flare (new window), in more of a zoomed-out view. Absolutely awesome, in the true sense of the word. Is it any wonder that our closest star has so much of an impact on life here on Earth? Wow.